Earth Day Bay County, Florida | Come Celebrate With Us! Thank You for participating in the 2019 Earth Day Bay County, our 15th consecutive year. The theme of rejuvenation and recovery was apparent simply by looking at the many Oaks trees that were trying their best to provide shade in spite of the windy conditions and a little rain early on. My health, unfortunately, kept me at my booth most of the day since I was avoiding spreading my chest cold, but people were great, especially all the old friends who came out, once the weather improved. Friends of St. Andrew Bay: BEST, Inc.
LGBTQ Center Of Bay County, Inc.
St. Andrews Honey: Charles Hay Jr.
Earth Day Bay County 2019 was held Saturday, April 20, 2019, from 10:00 AM to 4:00 PM at McKenzie Park, Downtown Panama City, Florida. Earth Day is a time to learn, appreciate and celebrate the natural wonders and beauty of St. Andrew Bay. This day we are reminded that we are custodians of these treasures, and their preservation depends largely upon what we do as individuals, and how well we make our voices heard by our elected and appointed officials. The earth will continue to regenerate its life sources only as long as we and all the peoples of the world do our part to conserve its natural resources. It is a responsibility which every human being shares. Through voluntary action, each of us can join in building a productive land in harmony with nature.” –President Gerald Ford, Speech proclaiming the first Earth Day, April 22, 1970. 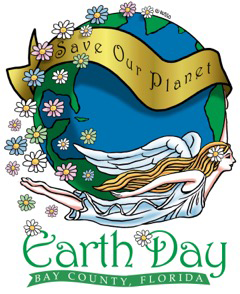 Visit our blog to learn more about Earth Day or to get information and photos from past events.